Wow! Chris you want me to pick my favorite Thrash Metal band. There’s so many ways I can go by choosing this, West Coast Bay Area, East Coast Thrashers, Old School, New School. Well, I’m going to go with consistency and there is only a few bands that hold consistencies with me but one that stands true to sound, look and their live performances. SLAYER!!!! Razor all the way man! Can’t believe I get to see them live at MDF. If it’s Bay area thrash, it’s Vio-Lence. Swashbuckle! Early Megadeth is up there for me too. 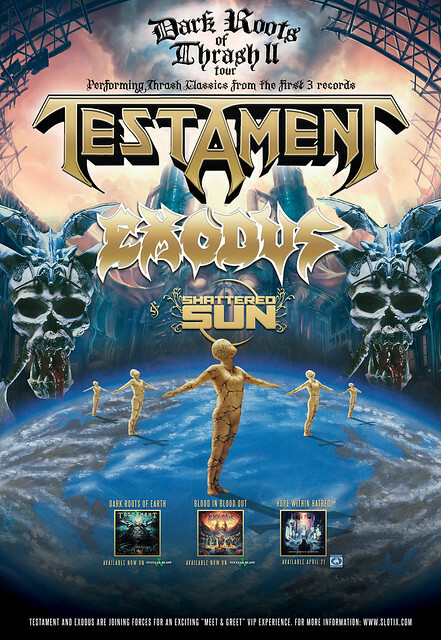 Wait… First 3 Testament albums? Really?!?! I was totally going to skip this. Serious reconsider going on here!! And oh, favorite? Very hard! Every favorite has worse albums… Except Slayer. They keep it up. And maybe Kreator. Damnit, do I have to pick one for it to count as an entry? My head’s going to explode. D.R.I. (Dirty Rotten Imbeciles) is my favorite thrash metal band. While the early stuff was more punk they developed the crossover sound and became my favorite thrash metal band in the process. I saw Slayer twice, It is pretty much the best trash metal band ever. EXODUS! Especially because they continue to put out quality music 35 years later. AND I’m organizing a bachelor party for a friend who has a DRI tattoo and, as such, I haven’t the money to get a ticket for this show.